The National Audit Office is the latest to put the boot in to the beleaguered Child Support Agency. In a report published today upon the implementation of the 2003 child support reforms the NAO states that the reforms "have failed to deliver the improvements in customer service and administrative efficiency, which might have been expected from the much-needed new rules, simplified calculation and a new IT system". Quite why we needed another expensive report to tell us something that has long been obvious I don't know, particularly as the government asked Sir David Henshaw to carry out a comprehensive review of the CSA, nearly five months ago. It's pathetic, isn't it - for years the Legal Services Commission has turned solicitors away from legal aid in their droves by failing to pay decent rates, and now they are ploughing nearly £3 million into luring law students to qualify as legal aid lawyers, bringing their total investment in future legal aid lawyers to £10 million since 2002. The LSC will pay training grants to students, including the £8000 cost of legal practice course tuition fees. Sounds like a good deal, but for the fact that those students will quickly lose that sum in the lower salaries that they will receive for doing legal aid work. This is the headline story in this week's Gazette, which also amusingly points out that the LSC is also spending £690,000 on a scheme to train 160 of their 'middle managers' in leadership skills, an average of over £4,300 per manager. As Rodney Warren, director of the Criminal Law Solicitors Association, says: "I just wonder what leadership skills [the managers] are hoping to acquire that they do not have already". Quite. The BBC reports today that there has been a rise in the number of complaints against the CSA. I don't think that this will come as any great news to anyone, or that any further comment is required from me. I am often asked what rights do grandparents have, so I thought I would write this post, for the benefit of non-lawyers. Grandparents (and, in fact, any other interested person) have the same rights as parents, as they can apply for the same orders (residence, contact, prohibited steps and specific issue orders) as parents. The only difference is that, unlike parents, they have to obtain the leave (or permission) of the court, before proceeding with the application. Leave will be granted in most cases unless, for example, the court considers that there is a risk that the application may cause serious disruption to the child's life. The most common type of application made by grandparents is for contact with their grandchildren. Once leave is granted, the court will use the usual principles to decide the matter, such as the ascertainable wishes of the child, the effect on the child of any change in circumstances and how capable the applicants are of meeting the child's needs. Most grandparents are granted contact, as it is generally considered that it is beneficial for children to have a relationship with their grandparents. However, the grandparents would obviously not normally be granted the same amount of contact as a parent. Lack of contact by grandparents is often linked to lack of contact by the absent parent, i.e. the grandparents' child. If the parent is him/herself making an application for contact then consideration should be given to whether it is necessary for the grandparents to also make an application, as often grandparents have contact during periods of contact by the parent. If it is considered necessary for both the parent and grandparents to make applications, then often the court will consolidate both applications, so that they are dealt with together. Of course, the above is just a statement of the law. For advice specific to any particular matter, consult a solicitor. Sometimes it seems from the media that everyone's doing it - Britney Spears, Joan Collins, Victoria Principal, Tom Cruise, Nicole Kidman, the list goes on. The reality, however, is that for ordinary mortals a prenuptial agreement is a very rare beast. The reasons for this are quite simple: (a) it doesn't occur to them, (b) if it does, it's not 'romantic' as it appears to question the parties' commitment to one another, (c) there aren't enough assets to make it worth while and (d) even if there are, prenuptials are not enforceable. There is some anecdotal evidence that such agreements have become more popular since the high-profile Miller and McFarlane judgment, but I seriously doubt that they will 'take off' until they become both legally binding and socially acceptable. It does seem generally agreed that prenuptials will become legally binding at some point in the near future, although to do so they will be subject to safeguards such as both parties taking independent legal advice before signing, both parties giving full disclosure of their means and a 'cooling off' period before the marriage takes place (one month has been suggested). There is also the problem of what should happen when any children are born. But even if prenuptials are given legal force, will people use them? I suppose the mere fact that they are enforceable may make them more popular, but I still can't see many people taking advantage. Certainly, I don't see prenuptials ever becoming the panacea for the perceived unfairness of the system that some seem to think they will be. You don't get much opportunity in the law to use your artistic talents, not that I have any - the '100' image I drew for the post below is the limit of mine - but the anonymous author of Nearly Legal describes him/herself as coming "from an arts background", and it shows in the interesting style of the blog. The blog sets out the writer's thoughts "on trying to become a lawyer and other things". As my art teacher wouldn't have said: "shows great promise". 1. DON'T ever use the children as ammunition in any dispute with the other parent. 2. DO always put the interests of the children first. 3. DO try to agree as many matters as possible. 4. DO consider mediation, if you can't agree matters with the other party. 5. DO instruct a solicitor who is a member of Resolution or the Law Society's Family or Children Panels. 6. DON'T defend divorce proceedings unless there is a really compelling reason to do so. 7. DO make full and accurate dislosure of your financial circumstances when dealing with financial/property matters. 8. DON'T argue over undisclosed assets, unless you are sure they exist. 9. DON'T make unreasonable claims, unless you like giving money to your solicitor. 10. DO comply with the Law Society's Family Law Protocol, unless there are good reasons not to do so - see my previous posts regarding the Protocol. If both parties follow these simple rules then animosity, cost and delays should be kept to a minimum. In what must be a pretty unique case, the High Court has ruled that no fewer than 193 marriages are valid, after an administrative error cast doubt on the validity of all marriages that took place at Langtons Register Office in Hornchurch, Essex, between 23 October 2004 and 24 March 2005. Not often that you hear a judge congratulating a couple "on having an undoubtedly valid marriage", although why it took so long to sort the mess out, I don't know. Details of this story can be found on the BBC News website here. Solicitor and Mediator Chris Oswald has written an article about the police and domestic violence, that will appear in the July issue of Family Law. He says that many police forces have domestic violence policies, which are often available on the net, so I thought I would check my local force. Sure enough, Kent Police have a policy, which can be found here. Pretty useful stuff, particularly as the police can usually respond to and deal with domestic violence far more quickly than a solicitor, as Chris Oswald also points out. In fact, it has long been my practice to advise clients that if they should suffer domestic violence they should ring the police first, before ringing me, although they should be aware that the perpetrator may still be arrested and prosecuted, even if the victim does not want to support a prosecution - see paragraph 18 of the Kent Police policy. Discussion of the Miller judgment continues today in an interesting article in the Times Online by David Pannick, QC. He considers that the judgment involves "compromises and unclear exceptions that will inevitably result in awards that are impossible to explain on any rational basis" and argues that "the law lords should have stated, for reasons of principle and for the pragmatic reasons of promoting clarity and certainty, that on the ending of a marriage (whatever its duration) all the assets of the two partners, surplus to their reasonable requirements, should be split equally". In case this is perceived to be unfair, he says, the law lords should have made it clear that a prenuptial agreement setting out a different division of surplus assets would be upheld. Of course, all of this is of only academic interest to the vast majority of separating couples, whose assets are only sufficient to meet their basic financial needs. I have just found out that the Second Edition of the Family Law Protocol is now available online - useful both for practitioners who have not received a free copy and for litigants in person. The online edition, in pdf format, can be found on the Law Society's website here. I have previously commented upon the Protocol - see, for example, my post here, which includes links to earlier posts. "That this House notes that Early Day Motion 128 'Parenting Time Presumption' has now been signed by 340 hon. Members of all political parties representing more than half of all hon. Members in the House; further notes that the Motion urges that separated parents should each have a legal presumption of contact with their children unless it compromises the safety of the child, but that the Government has so far declined to make these changes to the Children and Adoption Bill; calls on the Government to adopt the amendments which have been tabled for report stage of the Bill to achieve this end as supported by the majority of hon. Members; looks forward to all those hon. Members who have added their names to the Motion being present at report stage to add their votes of support; and, given the extraordinary level of interest in this subject, calls for a debate to be scheduled as soon as possible in Government time on the whole issue of shared parental responsibility and better parenting." I must say I would find it strange if a law change supported by a majority of democratically elected MPs were not passed, or at least properly debated. EDM 2367, together with details of the MPs that have signed up to it, can be found here. "FNF Kent Group meets at 8pm on the second Tuesday of each month at the Park Gate Inn (on the A20 Ashford Road at Hollingbourne). Between meetings, the group can be contacted via the website at http://www.fnf.org.uk/, through the National Helpline 0870 760 7496, or directly to Mark on 07766 978454 or Ian on 07837 055558. All new members can be sure of a warm welcome. There are opportunities to talk privately, confidence is assured and its free! You do not have to be an FNF member to come and seek advice." Thanks to the Branch Treasurer, Chris Wedge, for this information. Chris assures me that they do not dress up in Superman outfits! According to The Times, the Child Support Agency is to be scrapped this summer. Do I hear cheers, or is that just people watching the World Cup? Before anyone cheers too loudly, spare a thought for what will replace the Agency. Apparently, the idea is to encourage all separating couples (including where the parent with care is on benefits) to sort out child maintenance between themselves, following national guidelines on appropriate levels, and only involve the State where the absent parent refuses to pay the required amount. For this, a new agency will be set up and given extended tracking and enforcement powers, including access to credit details, greater use of deduction from earnings orders and inviting private debt collectors to bid for contracts to enforce payments. Whether any such new system succeeds will obviously depend upon whether the new powers will lead to a greater level of success in forcing recalcitrant absent parents to pay. Is marriage becoming a temporary state of affairs? An article in the Daily Mail yesterday highlighted the increasing number of long-established marriages that are breaking down. I was particularly interested in one of the reader comments that suggests that the present system of marriage be replaced by a '20 year child raising contract' or by 'renewable fixed term contracts'. It certainly seems that lifelong marriages are becoming a rarity, and may soon be a thing of the past, as more people decide that "the grass will be greener". Still, I suppose this has to be good news for us divorce lawyers, even if it's not always such good news for the people involved. On the 11th June the House of Commons Constitutional Affairs Committee published a report "Family Justice: the operation of the family courts revisited". The report deals with three issues: delays and lack of resources in the family courts, transparency in family court proceedings and mediation and the Family Resolutions Pilot Project. I have previously complained about delays, and the problem seems to be getting worse. In my local County Court (I won't name it, but you can work it out from my location), it is now taking months to get consent orders made, and it recently took a year to get a defective order amended. It is becoming increasingly difficult to explain these delays to clients, and no amount of chasing the court seems to make any difference. As I've said before, I'm not blaming the courts or their staff, the problem is obviously lack of funding/resources, and I can't see that improving any time in the near future. On the subject of transparency the report states "an obvious move to improve transparency in the family court would be to allow the press and public into the family court under appropriate reporting restrictions, subject to the judge’s discretion to exclude the public". OK, but I can't see the press being interested in family proceedings unless they involve celebrities and the only members of the public that will be interested will be family members of the parties, which will cause obvious difficulties. For those who don't know,the Family Resolutions Pilot Project ran between September 2004 and August 2005 in Brighton, Inner London and Sunderland and was designed as a pilot scheme to assist parties involved in court proceedings about contact after separation or divorce by helping parents to reach an agreement about contact arrangements. As the report states, the project was a clear failure. Apparently, the originators had hoped to get 1000 couples to participate in the scheme, but only 62 couples did so. Notwithstanding this, President of the Family Division Sir Mark Potter is clearly a fan of mediation and believes the solution is to make it compulsory. He dismisses the idea that you can't force people to mediate: "I just do not subscribe to that. If somebody is ordered to attend a first mediation hearing it is a very peculiar human being indeed who sits there with his or her arms folded and says, “I’m not going to play” when an experienced mediator gets to work". Perhaps Sir Mark, with his background in commercial law, does not realise just how intractable parties to family proceedings can be. When I mentioned the Law Commission's proposals to give property rights to cohabitees I said that there would be some who will say that this is just another erosion of the institution of marriage. Sure enough, the Archbishop of Canterbury has said just that, in an interview with the Sunday Times today. He complains that defining cohabitation creates "a kind of status that is potentially a competition with marriage or a reinvention of marriage". His primary concern is for the needs of children and states that "the question is about what institution in the long run best serves those needs". The assumption, of course, is that cohabitation is less stable than marriage. I'm sure there are many cohabiting couples that would challenge these views. "That this House believes that separated parents should each have a legal presumption of contact with their children, so that both parents can continue to parent their children and children are able to benefit from being parented by both their parents, as well as from contact with any grandparents and extended family members able and willing to play a role in their upbringing; and urges the Government to replace the legal term 'contact' with 'parenting time' and to ensure that parenting time orders can be and are made and enforced by the courts, save where a child's safety would be at risk." Details of which MPs have signed the motion can be found here. More important than M & M? Although overshadowed by the Miller and McFarlane judgment, the case of Martin-Dye v Martin-Dye  EWCA Civ 681 may infact be of more importance to most family practitioners. It concerns the question of whether pensions in payment should be treated as capital assets for the purposes of calculating the amounts required to achieve a clean break. The Court of Appeal decided that a division of property which left Mr Martin-Dye with his pension in payment as a major part of his share of the assets was unfair and a pension sharing order should have been made, in the same ratio as the division of the other assets. 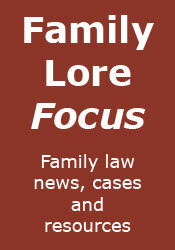 A full report of the case can be found on Family Law Week. Today the Daily Mail has two articles setting out each party's account of the case. Mr Martin-Dye's account can be found here and Mrs Martin-Dye's account can be found here. It is interesting to see how differently each party views the same set of facts. Complete with the slogans "Family Law Lotto. Next time it could be you" and "Don't gamble with your children". For anyone interested to see just how the group proposes that family law should be reformed, they have 'A Blueprint for Family Law in the 21st Century' on their site here.